Cat and Clean cat litter is a premium, white clumping cat litter, made from bentonite clay. It is three times more economical in use than a standard litter and helps ensure your cat's toilet remains clean and fresh, just the way it likes it! It is highly absorbent and the soiled litter rapidly forms into solid, flat clumps which are quick and easy to remove so it is not neceΒary to renew the entire contents of the litter tray. This cat litter is virtually dust free and it is of fine consistency so it does not stick to your cat's paws. When the litter is used, it releases a fresh baby powder scent to keep your house smelling clean. 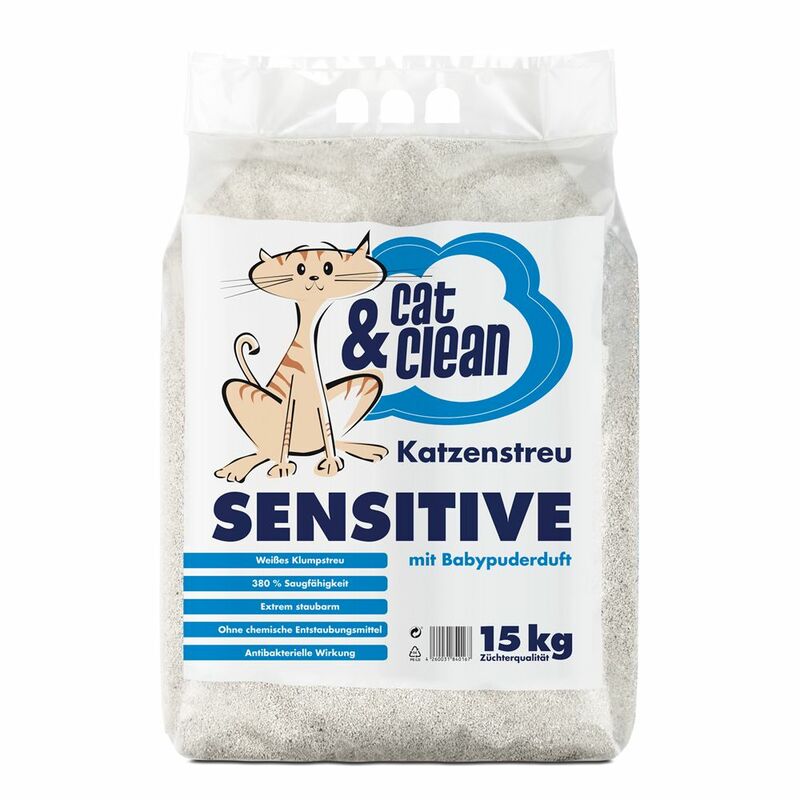 Cat and Clean Sensitive cat litter is suitable for cats with allergies and contains no chemical dust collectors. This fabulous litter has antibacterial effects. Cat and Clean Sensitive with Baby Powder Fragrance cat litter at a glance: Clumping litter made from 100% bentonite clay 320% absorption to lock in even more nasty odours Practically dust-free Suitable for cats with allergies For comfort and hygiene, without fastening to your cat's paws and being walked through your house Fresh baby powder scent Clump forming so very cost effective and easy to keep your cat's litter tray clean Economical in use: 15 kg Cat and Clean Sensitive equals approximately 45 kg traditional litter Antibacterial effects Pleasant white colour makes it easier to recognise soiled litter Fine granules of bentonite clay.